The first advertisement from RPCVs who oppose war in Iraq ran on February 21, on page A22 in the National section of The New York Times. Over 1400 RPCVs contributed to the ad. PCOL has been following the history of the ad campaign since they began in mid-January. Here is how the campaign evolved. For several weeks beginning in mid-January, Collin Tong and his Thailand 24 RPCV network sent out hundreds of messages to NPCA and RPCV listservs across the country. The original email said they were going to run a full page ad in the New York Times and that the ad would cost $40,000 to run as a standby. By January 29, the group had raised $7,500 toward that goal. On January 30, EPIC announced that after consulting with several Thailand 24 and Seattle RPCV colleagues, they had decided to revise their campaign goal for the NY Times ad. As donations stood -- they were close to $9,000 at that point and at the rate contributions were coming in (the average donations have been under $50), they believed that the earlier goal of raising $40,000 for a full-page ad might now be unrealistic and were looking at a more achievable goal of a half-page, horizontal ad (cost: $23,700). They were redoing the web-site "barometer" and setting a target date of Feb. 10th to raise the $23,700. On February 3, they announced on their web site that they had raised $13,500, that their goal was to raise $23,700 by Feb. 10 to place a 1/2 page ad on "stand-by," by February 15 and that any funds over the expenses mentioned would go toward the other advocacy efforts by EPIC in Washington D.C.
On February 3, PCOL ran a story about the group and their advertisement in our monthly newsletter and sent it out to 30,000 RPCVs on our mailing list and at that point contributions took off. Just one day later, on February 4 the EPIC web site announced that the group had reached their goal of $23,700 to place their half-page ad and that additional contributions would help support other EPIC advocacy efforts and initiatives to further their message. On February 6, the EPIC web site announced that now they were tentatively considering going for the full page ad again but that would mean raising over $3,400/day for the next 3 days and there are serious logistical problems to overcome. Later on February 6, they announced that that due to the overwhelming response the campaign has received in the past few days they were in the process of reassessing their goals, and that included whether or not to run a second 1/2 page ad to accommodate additional names. 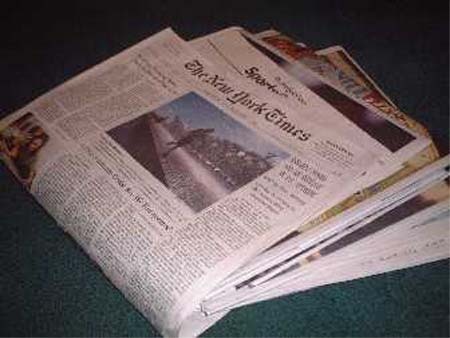 On February 7, the EPIC web site announced that due to the overwhelming response in the last week, they had decided to run two half-page ads in the New York Times. The first ad would be submitted to the New York Times next Monday, Feb. 10th and would run as a stand-by ad on the first available date. 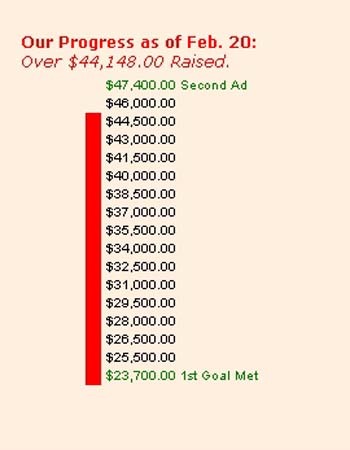 The second ad would follow in the first week of March and that once they had reached their goal of $47,400 for both ads, they would officially conclude the campaign. The first ad ran on February 21 in page A 22 in the National section of The New York Times. Over 1400 RPCVs contributed to the ad. "Today's New York Times includes an ad sponsored by and paid for by Returned Peace Corps Volunteers for a Better World in partnership with the Education for Peace for Iraq Center. 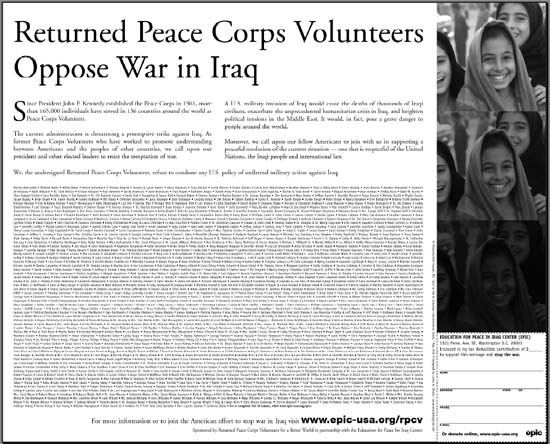 The ad, entitled "Returned Peace Corps Volunteers Oppose War in Iraq" appears on page A23. To view the ad online and to contribute towards a second ad, visit the web at http://www.epic-usa.org/rpcv. This campaign was spearheaded by RPCV Collin Tong (Thailand 1968 - 69)." At this point, the group is just $3,000 short of having funds to run their second ad and it appears certain they will reach that goal in the next few days for a second ad to run in March. Since President John F. Kennedy established the Peace Corps in 1961, more than 165,000 individuals have served in 136 countries around the world as Peace Corps Volunteers. The current administration is threatening a preemptive strike against Iraq. As former Peace Corps Volunteers who have worked to promote understanding between Americans and the peoples of other countries, we call upon our president and other elected leaders to resist the temptation of war. A U.S. military invasion of Iraq would cause the deaths of thousands of Iraqi civilians, create an unprecedented humanitarian crisis in Iraq, and heighten political tensions in the Middle East. It would, in fact, pose a grave danger to people around the world. We, the undersigned Returned Peace Corps Volunteers, refuse to condone any U.S. policy of unilateral military action against Iraq. Moreover, we call upon our fellow Americans to join with us in supporting a peaceful resolution of the current situation -- one that is respectful of the United Nations, the Iraqi people, and international law. This ad is sponsored by Returned Peace Corps Volunteers for a Better World in partnership with EPIC. This is Marge Huxtable looking for Mark Parkison, Former APCD PC Pakistan.